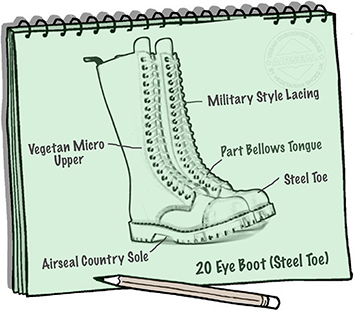 The 20 Eye version of our Flagship Vegan boot! The toughest, hardest wearing and most water resistant breathable material that we use. Like all our materials it takes little 'breaking-in', is exceptionally like high quality leather in performance and has a distinctive grain. Use polish or dubbin.